West Ham United faces Stoke City in Premier League at London Stadium,on Monday ,16 April 2018. Today night West Ham will be looking to take a big step towards Premier League survival, while Stoke hopping to be enough to ensure they avoid the drop. The Hammers sits in 15th place with 34 points,they have taken four points from their last two games to move six points clear of the relegation zone, Stoke, meanwhile, sits in 19th place of league table with 27 points , they are four points from safety heading into the weekend and will be aiming to avoid a fifth successive defeat. 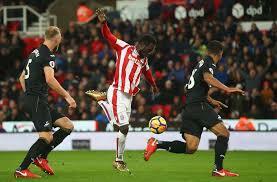 Stoke will again be without forward Maxim Choupo-Moting, who is injury, and midfielder Maxim Choupo-Moting remains a doubt, having not featured since March 17 because of groin problem. No Comment to " West Ham United vs Stoke City: Praimer League live stream info "